German-based graphic designer Zhi-Yun has his eye on today’s top pop culture icons. 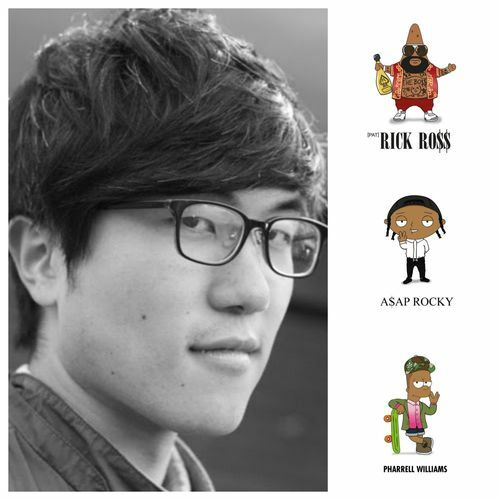 His series of Cartoon x Pop illustrations have attracted attention from Maybach Music, ASAP Rockyand Pharrell.We got in touch with Zhi-Yun, who told us about his brush with the stars. “I am still overwhelmed by the response,” says the humble illustrator. “Since that I got some requests to work on shirt designs and I have some new projects in mind… but I will see what the future brings me”. Naturally, we had to ask him to do an #IITS6 so we could learn more about his creative process. Lets see what Zhi-Yun had to say! 1. If you could meet anyone in the world dead or alive who would it be and what would say to them? It would be nice to meet my grandmother again. I was too young at that time to have a real talk with her. So I would love to chill with her and listen to her wisdom. First of all Michael Jackson. I would ask him if he can show me some of his dance moves. He was the greatest. Haha. Then Akira Toriyama – the inventor of Dragonball Z. I would tell him, that he was the biggest inspiration for me to begin drawing my first Dragonball-Z characters. Through this I have paved my way to a graphic designer. The last one would be basketball player, Kobe Bryant. Basketball was always a part of my life, and he was my idol in my teenage years. He is still the best player for me. A practice match against him would be a dream and I would also like to talk with him about strength and mentality. I wouldn’t pick any of them. I Love my parents, and without them I would not be me. Haha. “Heard em say” from Kanye. It would be Flying. I could fly everywhere to explore the world and see it from above. 5. What makes your artwork unique from others? I think the only aspect that makes my work unique is because I am the only person who has done it. All of the inspiration I get from the world goes into my work. Like any other artists/designers take their inspiration and put it in to their work. 6. Do you have a famous affirmation that inspires you or if not one of your own?